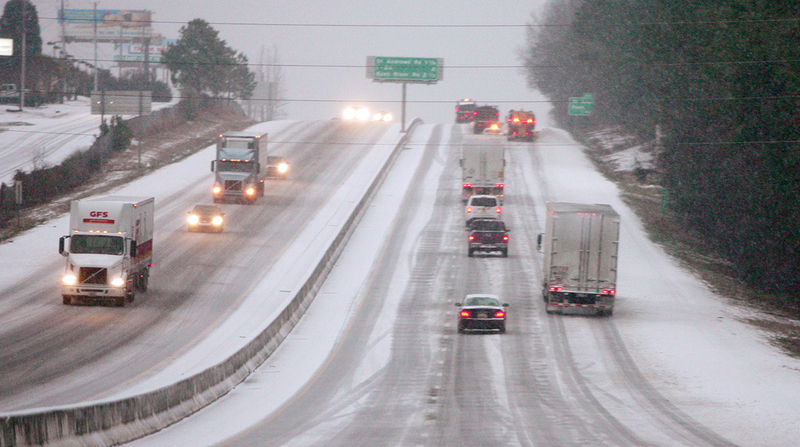 When winter weather arrives, what also comes with it is the use of road salt, which exacerbates truck corrosion. Heavy- and medium-duty truck OEMs recognize how costly and dangerous corrosion can be. As a result, they aim to mitigate the problem with anti-corrosion coatings on key parts of the vehicle. Nearly all modern trucks come standard with anti-corrosion coatings on at least some of the rust-prone metal components. The body, undercarriage, wheels and areas within the truck’s splash zone receive particular attention. “The whole chassis is exposed to the elements,” said Brett Wacker, vice president of maintenance at Dart Transit. Another area of big concern is the fifth wheel, he said. “If you don’t do proper maintenance and coatings on your fifth wheel jaws and locking mechanism, you could have a false lock,” which leads to a dropped trailer, he said. Coating manufacturers also work with truck makers to develop products that meet specifications to withstand the rigors of heavy-duty freight hauling. “Corrosion and the effects of corrosion are at the top of the improvements we are focused on,” said Dan Szczepanik, global market director of transportation for Sherwin-Williams Performance Coatings Group. Coated truck components usually go through multiple steps of treatment, including an electro- deposition coating process, said Szczepanik, who is a member of the Technology & Maintenance Council’s corrosion working group. “It’s a dip, so the chassis or the cab will be fully immersed in this bath, and when it comes out the primer will coat all the nooks and crannies with a very even film build, even on the edges.” TMC is a council of American Trucking Associations. OEMs decide how many layers of coating to use, with many of them including at least one epoxy layer for long-lasting protection. Johan Agebrand, director of product marketing for Volvo Trucks North America, said Volvo’s trucks have three layers of corrosion- prevention coating on the inside surfaces and five layers of coating on the outside of the cab. The different layers provide protection from corrosive salt solutions and ultraviolet light — an element that contributes to corrosion. The layers also resist degradation from chemicals such as gas or hydraulic fluid, in addition to dings and chips that can cause moisture to wick underneath paint and corrode any exposed metal. Aftermarket parts manufacturers use a similar process for applying anti-corrosion coatings. These coatings are standard on every wheel and save fleets money in the long run, said Dennis Winn, director of technology and business development at Accuride Corp., a manufacturer and supplier of commercial vehicle wheel components. In addition, the coatings can save fleets points based on federal rules because inspectors often spend more time searching for safety violations on trucks that appear rusty, he said. But fighting corrosion isn’t just a matter of money or aesthetics. Rust poses safety risks to truckers and others on the road by causing component failures. That’s partially what prompted Triangle Suspension Systems to recently improve its water-based corrosion protection on undercarriage components, especially leaf springs. OEMs, aftermarket parts manufacturers and coating manufacturers spend much time improving coatings in response to customer feedback, experts said. A recent round of improvements occurred because state road authorities changed the de-icing agents they have used over the past 10 to 15 years. The addition of brine solutions and those containing magnesium chloride and calcium chloride — as opposed to rock salt’s sodium chloride — yielded a plethora of complaints from carriers about increased vehicle corrosion. The new solutions stay wet longer and at very low levels of humidity, plus they splash and stick in tiny crevices. Fleets were impacted by those de-icing chemicals and asked product manufacturers for help, Winn said, noting that prompted Accuride to upgrade its wheel coating five years ago. Sherwin Williams’ laboratories have developed new anti-corrosive coatings to address the de-icing solution change, Szczepanik said. The life spans of anti-corrosion coatings vary depending on their chemical makeup and which part of the truck they’re on, in addition to the frequency and duration of exposure to harsh road and weather conditions. A fleet’s maintenance cycle also plays a huge role in extending coating life. Aftermarket components sometimes have a shorter corrosion- protection life cycle than the body, largely because they are in the splash zone and take a heavier beating. Still, the anti-corrosion coating should last for several years. For example, Accuride’s wheels come with a five-year warranty, although that is conservative, said Timothy Weir, director of communications and government relations for Accuride. Frequently washing vehicles — at least after each salting event— is the most important anti-corrosion maintenance procedure, the experts agreed. Thorough inspections are equally important to spot and stop rust before it grows out of control. Fleets also can apply aftermarket anti-corrosion coatings on visible and hidden corrosion-prone truck components, such as the undercarriage. “OEMs should have the main responsibility to build a truck with decent coatings, but they can only do so much at the factory,” said Tim Brune, technical director at Automotive International and a member of TMC’s corrosion working group. Aftermarket coatings have a much shorter life span than OEM-applied coatings, but generally they should retain their protective properties for a minimum of a year, experts said. “I look for an OEM equivalent or something that is directly from the OEM,” Dart’s Wacker said. Dart prefers to renew coatings approximately every 250,000 miles. TMC’s corrosion working group publishes recommended practices for extending the life of anti- corrosion coatings. It recently completed recommendations related to new vehicle add-ons, considering that the first thing fleets do “is drill a bunch of holes” or make cuts to install additional components, Winn said. That pierces anti- corrosion coatings, and corrosion then can start on a fleet’s brand new tractor or trailer, he said. Estimates put corrosion’s cost to the transportation industry at more than $1 trillion a year. Although coating maintenance and refurbishment might seem labor and cost intensive, it’s “better than the alternative,” Wacker said.